The goods and services provided by forests are manifold and indispensable for people and the environment. Forests are crucial, among other things, for stabilizing soil, providing water resources, supporting biodiversity, protecting against natural hazards, delivering timber and non-timber products, and, quite importantly, combatting climate change. In order to ensure that future generations will be able to enjoy the same benefits from forests, sustainability is indispensable in the management and use of natural resources. How can we achieve and enhance sustainability? We know that “Today is a son of yesterday and a father of tomorrow.” Therefore we rely on a collaborative partnership between the young and the older generations. We need to pay more attention to young people. In IUFRO, for example, we have established a successful partnership with IFSA, the International Forestry Students’ Association to include more students and junior professionals in our network of scientific cooperation. 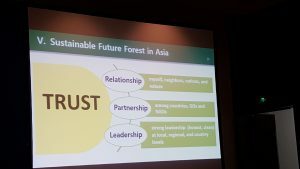 And how is forest sustainability progressing in Asia? As the world’s largest and most populous continent Asia is a highly diverse region in terms of culture, society, policy and population. 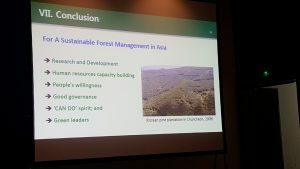 Despite this diversity, however, forests are an important component for all Asian countries; Asia has plenty of natural resources with a lot of potential for ecological, social and economic benefits. Therefore, in Asia, there is a strong need to enhance research and education to contribute to achieving economic growth without environmental degradation, which should be the main goal of every country. “We must think globally and act locally as well as globally.” Research and education need to be developed to cater for current and future needs, and to increase our problem solving capacity in view of issues such as scarcity of land, desertification, unbalanced food supply, pollution etc. Here, the UN Sustainable Development Goals (SDGs) provide a roadmap for sustainability both on the local and the global levels. The achievement of sustainability rests on three pillars: relationships, partnerships and leadership, and all of them need to be based on trust. It is essential to create good relationships with our neighbors and with nature, we must establish partnerships among countries and organizations, and we need strong and honest leadership at local, regional and global levels. The success story of reforestation in Korea based on good governance, green leaders, human resources capacity building, and the willingness of the people to cooperate, serves as an excellent model for progressing towards sustainability. This model can be summed up in the “CAN DO” spirit and underlines that the successful combination of diligence, self-help, cooperation, service, sharing and creativity are a promising and proven pathway towards achieving sustainability.